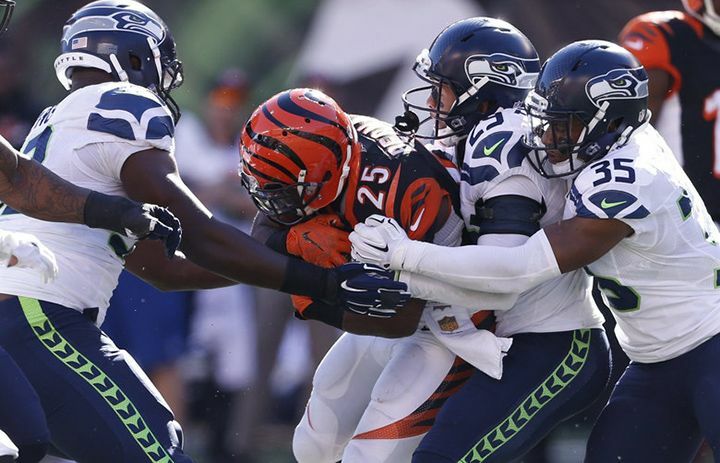 Pro Football Focus had good marks for Russell Wilson but not so good for Kam Chancellor and others in the secondary for Seattle's loss at Cincinnati Sunday. As might be expected, there is lots of interesting stuff in the grades from Pro Football Focus for the Seahawks Sunday. Here is their overview. PFF also assessed Kam Chancellor as the worst at his position this week. And here are some added notes from PFF as well as snap counts at the bottom. Despite the result, Russell Wilson continues his solid play. He finished with a +3.2 overall (+2.6 passing grade) and has the fourth-best overall grade in the past three weeks. Also in the past three weeks, only Carson Palmer and Andy Dalton have a higher pass grade (13.2 and +12.8) than Wilson’s +7.0. Only two of Wilson’s 20 attempts were thrown left of the left numbers. While he went 9 of 11 on throws between 0-9 yards, he only mustered a cumulative -0.4 grade on them. Boosted by his 69 yard TD run, rookie Thomas Rawls graded at +2.5, third-best for Week 5 behind only Doug Martin and Dion Lewis. This week Rawls ranks second in run grade, yards after contact/attempt, and yards/attempt, and first in rushing yards. Doug Baldwin led the receiving core with a +1.4 and now has four straight green games. His +5.3 on the year is 14th and is a vast improvement from where he was last year at this same time (-0.8). Right guard J.R. Sweezy with back-to-back green games (+1.1 and +3.2). His +2.2 run blocking grade is currently second-best this week among RGs. Aside from Sweezy, the other four starting OL all finished with red grades. Larry Stone: Are the Seahawks' days over as a dominant, feared powerhouse? Just how epic was the Seahawks' fourth-quarter collapse? KJ. Wright led all defensive players with a +3.2 overall grade and interestingly also had the best pass coverage grade on the team (+2.1). The normally high-graded tandem of Michael Bennett and Cliff Avril were held in check grade-wise, combining for only +0.5. Kam Chancellor was the most targeted Seahawks secondary player, allowing nine receptions on 11 targets. Bengals receiver breakdown against him: Sanu 2 of 2, Bernard 3 of 4, Eifert 3 of 4, Jones 1 of 1. Sanu and Eifert combined for 13 of 15 for 159 yards (55 YAC) and two TDs (both Eifert). With the Monday night game to go, Williams currently has the second-worst coverage grade for CBs while Chancellor is last among safeties. Kelcie McCray made three special teams tackles, the most for Week 5. His +1.5 special teams grade is tied for the best this week (excluding kickers/punters). Hauschka currently grades as the eighth-best kicker on the year at +9.9. His +3.9 on field goals and extra points is tied for third-best. Wilson had a 68.5% yards in air rate (YIA) this week, continuing the vertical pass game trend. This brings his 2015 YIA% to 59.0%, up drastically from 46.1% last season. Wilson saw pressure on 51.7% of his dropbacks but did grade at +1.7 on 15 dropbacks. Seahawks receiving core had zero drops and on the year their 2.0% drop rate is second-best. On the year, Wilson has a -4.4 YPA difference with and without play-action. He’s actually averaging 8.8 YPA without play and only 4.4 YPA with it. This is the biggest negative difference among QBs. His completion percentage also drops when using play-action, going from 73.8% to 57.1%. Yards per route run thru Week 5: Willson 2.13, Kearse 1.69, Baldwin 1.62, Graham 1.25, Lockett 1.09. 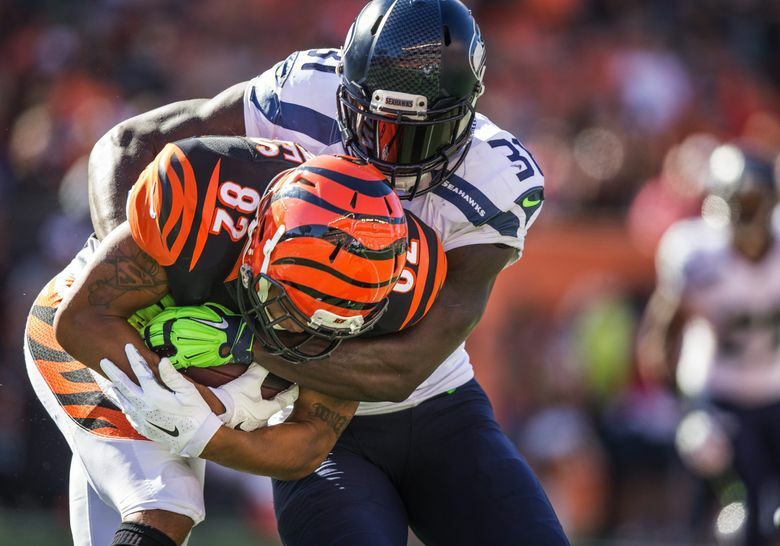 Since starting in Week 3, Thomas Rawls is averaging 2.82 yards after contact/attempt, 11th among HBs. His 46.1 breakaway rate over the same span is seventh, buoyed by his five 15+ yard runs. Rubin and Hill continue their stellar interior run defense. They are fifth and sixth in run stop rate for DTs. No other team has two DTs in the top ten. OL update—Seahawks drop in the pass block efficiency rankings from 26th to 29th even though they saw a slight increase going from 73.9 to 74.2. Chancellor had a 2.04 yards/coverage snap allowed figure, fourth-worst for safeties who played a minimum of 25% of the snaps this week. His 102 yards surrendered was the most.